Granted, only seldom the Christian mind zooms in on animals. Also in the Bible they tend to be more in the background than in the foreground. You may be surprised, however. Enter an Eastern-Orthodox church building. In front of you a wall of images rises up, sober or richly decorated, but always with three doors. Besides and above these doors you will see icons, sometimes up to seven rows. This is the ‘iconostasis,’ the wall of icons. Western eyes get lost in this overwhelming realm of images. The trained eye of the Orthodox believer knows its way in. The Orthodox liturgy, chants and prayers form an indispensible source of elucidation for this visual mini-cosmos. When it is one of the main feast days of the Christian calendar, the believers will automatically focus their eyes on the second row of icons above the doors. It is there that the twelve most important festive days of the Church have been captured. Each feast concentrates on one of the Christ mysteries, often mingled with related events from the life of Mary. Together they form an annual cycle around the most essential feast of Christianity: Easter. And there, almost in the centre of the row of images, you will see the only animal in the iconostasis: a donkey, or rather a donkey rider, surrounded by people who are waving branches. Our visual faith routine recognizes the representation immediately: Jesus’ entry intoJerusalem. This is the icon of Palm Sunday, the Sunday that opens Holy Week. This icon depicts a well-thumbed-well-known gospel story (Matthew 21:1-17; Mark 11:1-10; Luke 19:28-44; John 12:12-16). The visual elements are always conventional and prescribed by tradition. And the donkey? She is a fixed attribute of the Palm Sunday story. Visual artist Wasili Wasin, born in the Urals and since 1984 living in Kaliningrad, in the far west on the Baltic Sea (formerly Königsberg), both in Russia, also follows this tradition, though in a wilfully different way. While an icon has no third dimension, the wooden surfaces of Wasin with their modest relief transcend the prescribed flat plane. In this way the representation gains in proximity. 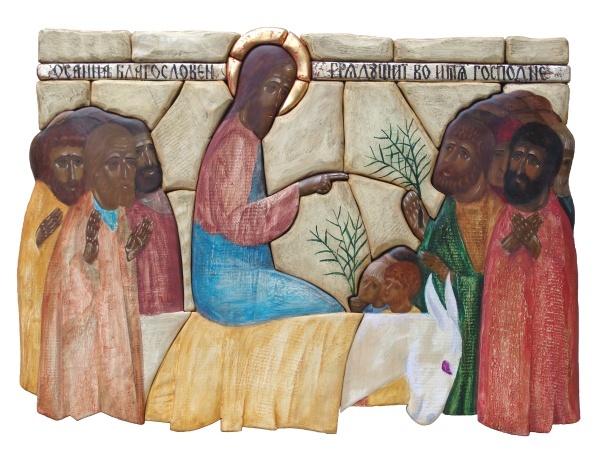 While looking at the icon two things start to stand out: Christ’s fingers and the donkey. It is as if they both point in the same direction. That donkey as well as those fingers are quite subversive, making a risky statement. Consider this: Matthew points out that Christ rode on a donkey with her foal next to her. Is there anything less militaristic, a more peace-loving symbol than a mother beast with her young – and that as a mount for the king of the Jews? Three centuries before Palm Sunday, in 332 BC, Alexander the Great triumphantly entered Jerusalem after the bloody conquest of Tyrus and Gaza – in flashing outfit of course, looking down from his stallion Bucephalus. Also Pilate used to ride into the city in full regalia and with a heavily armed guard at the beginning of the Jewish Passover (the politically sensitive period during which the deliverance from slavery was commemorated). No mistaking who was the boss! But the pointing fingers and the donkey of the Wasin icon communicate a totally different message, that of Palm Sunday and the gospel. The donkey embodies the anti-symbol: not the sword but peace, not pride but humility, not power but servitude. Christ’s gesture seems to only underline this. As if he wants to say: the Christian life is a spiritual triathlon, an all-round competition, not a 50 meter sprint. Just like I persisted, you should as well! Wasili Wasin: Entry into Jerusalem, limewood panel, fish glue, powdered chalk, pigment, tempera, oil paint and gold leaf. With thanks to Gallery Zwijsen for the image, see www.galeriezwijsen.nl. Wasili Wasin was born in the Ural Mountains in 1957. He is a trained artist as well as a craftsman. He has created several large monumental works for Russian buildings. He has lived in Kaliningrad, Russia (formerly Königsberg) since 1984. In 1993 he was accepted as a member of the Russian Artists Association. His work can be found in the permanent collections of Russian museums and in private collections in Germany, Japan, Poland and the Netherlands. For more information, see www.wasili.nl. Alfred C. Bronswijk is a theologian and writer. He has worked as a pastor, broadcaster and teacher. He has written poetry, songs, contemporary prayers and various books. Recently he has published a book about icons.